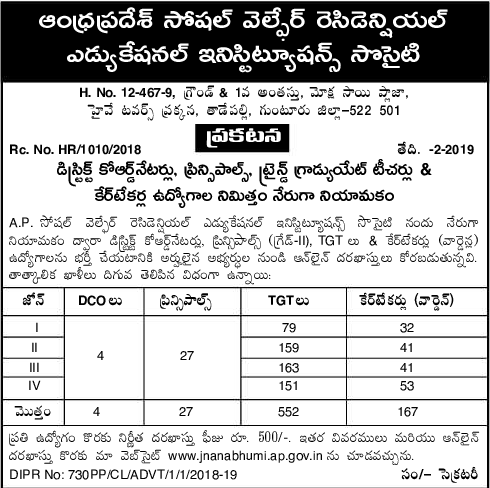 vacancies available for Andhra Pradesh APSWRS Recruitment 2019. Interested and eligible candidates can apply through online official website of APSWRS is janmabhumi.ap.gov.in from 11-02-2019 onwards. The closing date to submit the filled online application form along with the necessary documentation is 00-00-2019 (will be updated soon) for the APSWRS Recruitment 2019. The recruitment process will be done through a written examination. 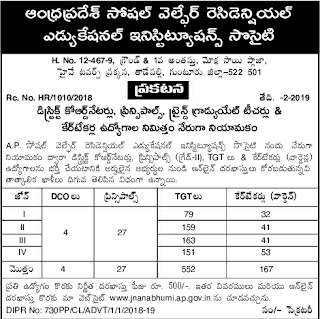 For more details of required qualification, salary, age limit and how to apply are given below for the Andhra Pradesh APSWRS DCO, TGT, Caretakers/warden, Principal Govt Jobs Recruitment 2019. The upper age limit for the candidates is 42 years to apply for the APSWRS Recruitment 2019. DCO posts – Degree with B.Ed. Principal posts – B.Ed./M.Ed./ and PG/Degree with minimum teaching experience is must. Caretakers/warden posts – Degree with B.Ed. The candidates will be shortlisted based on the written examination and document verification. Interested and eligible candidates can apply through online official website of APSWRS is janmabhumi.ap.gov.in from 11-02-2019 onwards. The closing date to submit the filled online application form along with the necessary documentation is 00-00-2019 (will be updated soon) for the Andhra Pradesh APSWRS Recruitment 2019.